When travelling to far and fabulous places, it is always a bit of game changer to have some handy tips at hand from those best friends in the know who always seem to be able to unearth the most incredible places. At KOTUR, we like to pick the brains of some particularly fabulous women before we travel, getting tips on where to Eat, Shop and Play when abroad. 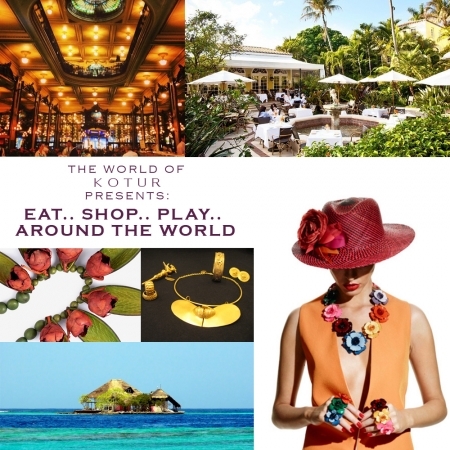 Recently on our Blog, we have travelled to Istanbul, Madrid and Palm Beach with the jewelry designer Jennifer Creel, been to the Bahamas, Rio and Cartagena with Film Art Creator Fanny Pereire and journeyed to Saigon, Shanghai and Hanoi with fragrance maven Kate Crofton Atkins, all of whom have imparted their extremely individual and stylish advice on what to do when in some of their very favorite destinations.